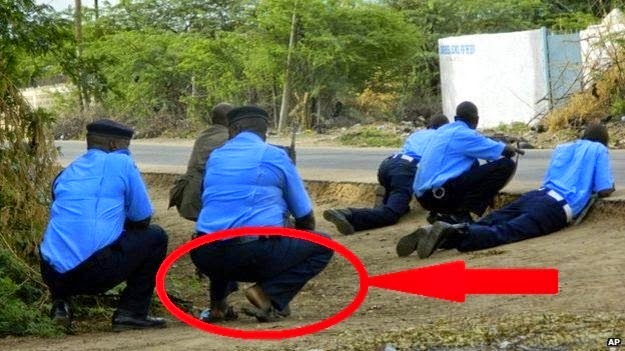 During the Garissa university terrorist attack, the area police are said to have been the first ones to respond, but what surprised many is how they came to confront the suspects without proper gear. In one of the pictures which has been going around social media and international new sites, on cop is shown taking cover to wait for the terrorists with simple sandals, how did he expect to run after the terrorists? Even as rumours was rife of impending attack,they deployed only two policemen each with one rifle and 20 rounds of ammo.The militants had extra rounds of ammo hence more fire power.That is why one of the policemen was killed after he ran out of bullets.